Compared to regular ladies shavers, electric shavers for women are certainly more expensive. You can expect to spend at least $10 for a standard model to as much as $100 or more on a quality model. The expenses don’t stop there. Maintenance can be just as expensive. You have to replace the shaver head and replace the battery at some point too. So do you still want to buy an electric shaver? We hope, yes. Because while ladies electric shavers may cost you, they offer convenience and performance no regular shaver can match. It’s a matter of finding the best electric shaver for women that offers both quality and great value for your investment. Don’t know which electric shaver to buy yet? That’s exactly what we’re here for. We’ll help you find the best brand and type of electric shaver to meet your needs and personal preference. Whether you’re buying the best electric shavers for men or the best shaving razors for women, buying one can be agonizing not to mention a whole lot confusing. When all you want is to grab a product that does the job, the market gives you an array of choices to compare. But you don’t have to stay confused any longer. To help you sort out the different electric shavers for women, we tested and reviewed some models including brands that are familiar to a majority of consumers. Now that you have a pretty clear idea of the best rated electric shaver models you can buy, it’s time for a more in-depth review of each product. Below are detailed reviews, which includes pros and cons to further help you finalize your buying decision. If we’re going to go through the numerous best ladies electric razor reviews, you’ll see that plenty of consumers have mostly good things to say about Panasonic ES2207P Ladies Electric Shaver. Designed to smoothly glide along your skin, this electric shaver is perfect for shaving your legs, underarms and even bikini area. It’s also suitable to use wet and dry. But what really makes this Panasonic shaver a bestseller is the super sharp razor blades and the foil, which is perfect for sensitive skin. Whether you want to use the Panasonic ES2207P for shaving or just trimming, it does the job smoothly thanks to the three floating head system. This is exactly what you need if you want to shave legs without the bumps. You’ll get a portable charger and a travel pouch when you opt for this bestselling electric shaver model. It’s not only handy to use in the shower with your favorite shaving gel or soap lather but it’s also a convenient travel companion. If you want to be practical and you don’t want one razor for your legs and another for your bikini area, this Schick 2-in-1 razor is exactly what you are looking for. It’s not just a hydrating razor on one end, but it’s also a waterproof bikini trimmer on another end. This is a battery-operated model with three length settings offering you the ultimate convenience. If you want to shave your legs, use the razor with hydrating hydro silk feature. If you want to trim your bikini area, just flip the handle. Shaving or trimming doesn’t get any more convenient than that. 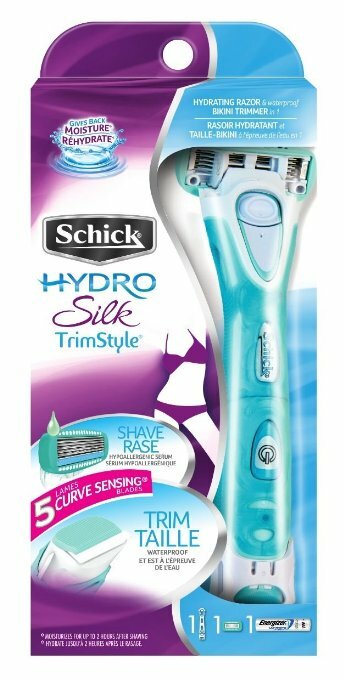 Not only is the Schick Hydro Silk TrimStyle Moisturizing Razor dual-function, it’s also incredibly affordable. In fact, this is the most budget-friendly razor we have included on our list. No wonder why this model is also getting rave women’s electric shavers reviews left and right. There’s just one downside. While super affordable and innovative, this Schick razor is not best for sensitive skin. But if you’re really careful and you use shaving cream or gel, this one could get the job done in any case. If you’re looking for a bikini shaver and trimmer that you can conveniently carry on your travels, look no further than the Panasonic ES246AC model. Ultra-slim, lightweight and portable, this little gadget is only 1.3 inches across and weights about 4.8 ounces. But more than the portability, what sets this product apart is the personalized trimming experience you get to enjoy. 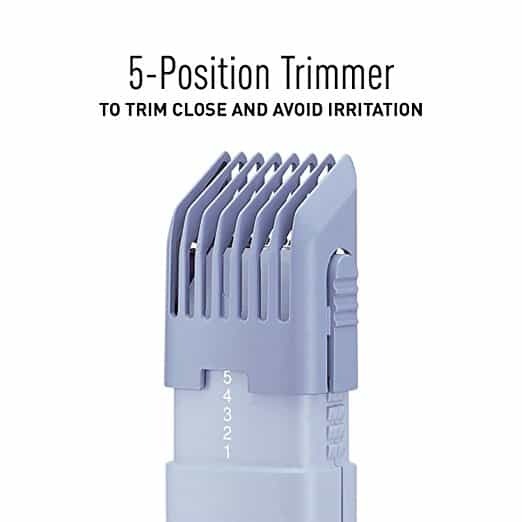 With five trim settings, this cordless personal shaver is both safe and hassle-free to use. Compared to other standard sized razors, this thing also does the job faster. 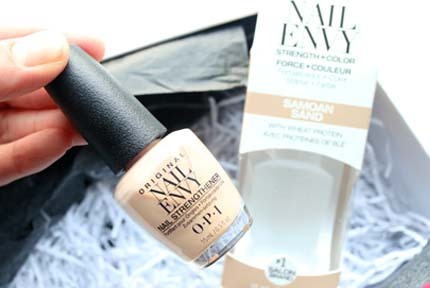 You’ll have neater and smoother bikini line in no time. While the Schick razor was dual-function, this one is specifically designed for the bikini area. If you use it to shave your legs, you’ll probably only end up frustrated. The bikini trimmer is battery-operated and will require 2 AA-size batteries, which you need to purchase separately. Other than that, the Panasonic bikini razor is easy to maintain. It comes with a cleaning brush for regular cleaning and maintenance. If you’re willing to spend money on a quality epilator, we highly recommend the Braun Silk-épil 9 9-579 Wet and Dry Epilator. 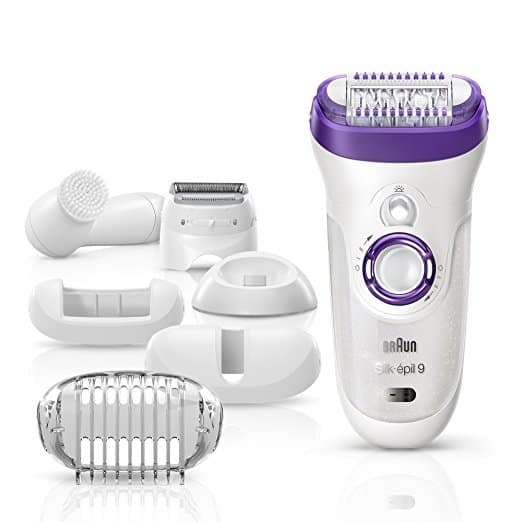 Not only is the product getting rave electric razors for women reviews, but it’s also one of the popular bestsellers from the line of Braun electric shavers. This is the bonus edition of this Braun razor model with a price tag of over $100. You might not want to spend that much money on an electric razor, but there are good reasons why this is a worthy investment. Let’s start with what you’ll get. This bonus edition includes a number of extras such as shaver head, trimmer cap, massage cap, charging stand, skin contact cap, and a facial cleansing brush. It has practically everything that you need to keep your entire body hair-free and silky smooth. But what really makes this Braun shaver a worth investment is the innovative design, which now features 40% wider head. With just one stroke, you’ll be able to remove more hair than standard lady electric shavers. That also means enjoying smooth skin for up to 4 weeks. You’ll likely only use the razor once or twice a month. With proper care and maintenance, this investment can last for years. We have to include another Braun razor but this time, this model is less expensive than the bonus edition above. 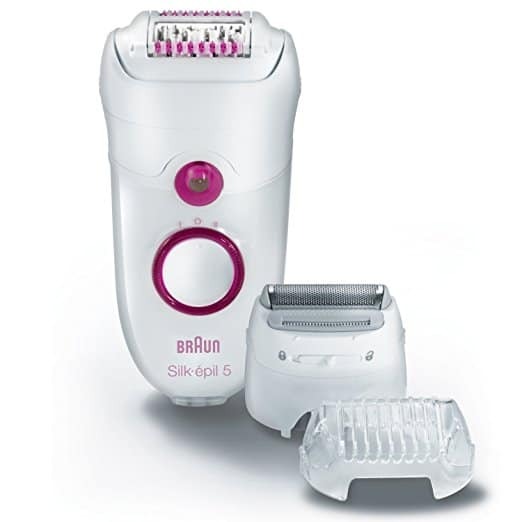 If cordless electric razors do not seem to get the job done, what you need is a corded razor just like this Braun Silk-épil 5 5-280 Electric Epilator. You can only use this for dry shaving but the non-stop power it offers also ensures non-stop smoothness. In fact, this powerful electric razor is advertised to be better than wax. With its Close-Grip 40 Tweezer Technology, the Braun Silk-épil 5 can catch hair that is 4x shorter than what wax can get. Aside from the impressive Close-Grip technology that features 40 tweezers working together to give you smooth skin, this Braun epilator also has a Comfort System. It does not only shave or trim your hair but it also massages the skin and even has a cooling glove effect when you’re done. Is shaving your legs bad for you? That’s probably one of the first questions you’ve asked when you started to think about shaving. There are two ways to answer the question. When done wrong, it can be really bad. But when done right, you get to enjoy smooth legs for weeks at a time. How do you ensure you are shaving your legs right? You need to get the right electric shaver. 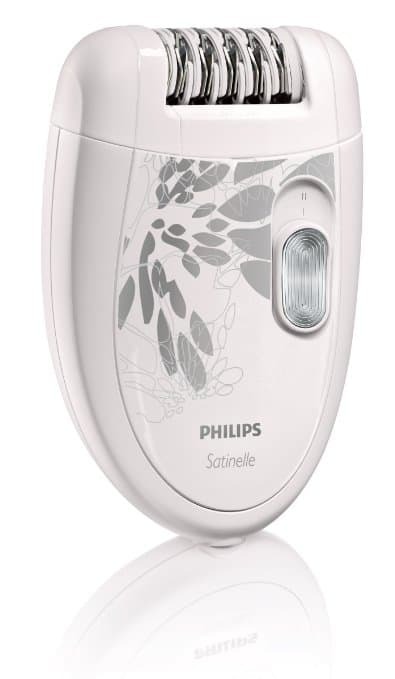 One of the best women’s razors for legs is this Philips HP6401 Satinelle Epilator. It features a two-speed system that removes hair from the roots. This means long-lasting smooth skin for weeks. The Philips epilator is suitable for total body hair removal from your legs to underarms, bikini line and other sensitive zones. To cap off our list of the best women’s electric shavers, we have here the Remington WDF5030A Foil Shaver. This rechargeable razor features an angled head so it glides smoothly over your skin. There are four blades that comprise the open blade system. When these blades pass through your skin, the foil shaver works smoothly without hair built-up or any kind of interruption. Another plus is the almond oil strip feature which moisturizes your skin as your shave. It’s also anti-microbial and 100% waterproof. 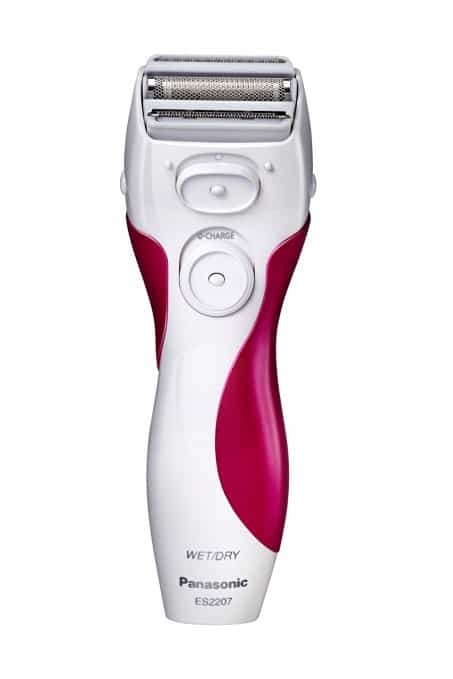 Do you want to opt for an electric shaver or an epilator? How much should you spend on the best electric razor for women? These are a few questions that may have popped up in your head when shopping for a women shaver. In this women’s shaver buying guide, we’ll help you answer those questions, in addition to helping you pick a product to suit your needs. Before you can find the best shaver for women, you must first establish what your needs and preferences are. Is the shaver for your legs or bikini line? To do that, you can answer a few questions. How smooth of a shave do I want? Do I want a razor that I can use wet, dry or perhaps both? How often should I shave my legs? Am I prone to razor burn? Am I comfortable using a shaving cream? And how much pain can I tolerate? If you have sensitive skin and you want to know how to shave legs without razor burn then you’ll need the best women’s electric leg shaver. Most electric razors for men and women can be used wet or dry. You don’t even need to use shaving cream to get started. In terms of silky smooth results, manual razors may offer smoother and hairless skin while electric razors for women legs may leave some tiny hairs behind. If you don’t want to shave your legs frequently, using an epilator rather than razors is recommended. Epilators are designed to pluck out hairs from the roots, which means no shaving for up to four weeks. On the downside, epilators can really hurt. If you have a low level of pain tolerance, you better stick with electric shavers for now. 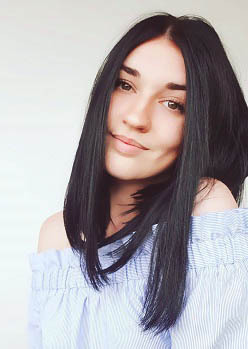 Whether you have sensitive skin or you’re looking for a shaver for the bikini area, there are different types of women’s shavers available in the market. 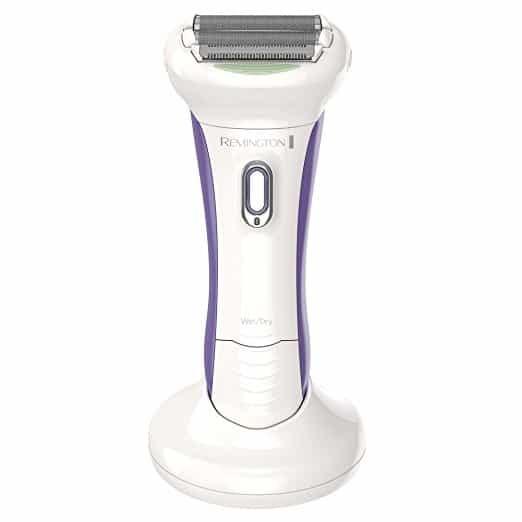 The best women’s razor for sensitive skin is an electric shaver as they reduce risks of razor burn, cuts or nicks. They’re convenient to use and you’ll have hairless skin quick. You also don’t have to worry about how to soothe razor burn on legs anymore. If there is the best razor for shaving legs, there are also the best shavers for bikini line. Bikini line shavers are designed to specifically work with the type of hair and the tricky angles in your bikini area. These shavers feature angled heads and are smaller as well as cheaper. Just like the best shaving razors for men, razors for women come in two varieties- disposable and refillable. With disposable options, you just throw it away after use. With refillable models, you’ll have the added cost of razor blades and cartridges to choose from. Unlike best women’s electric leg shaver, epilators are motorized and are designed to pluck your hair out by the roots. This type of razor can be painful and slower in terms of efficiency than an electric shaver. Epilators are often recommend for shaving small areas like the bikini line or underarms. We all want something that’s easy to use. You might also want to look into wet and dry shaving. Some models, even the Walmart shavers, let you shave in the shower easily. You’ll also want an electric razor for women that’s easy to clean. Most models come with a cleaning brush while other models just need to be rinsed clean. One downside with electric shavers for women is the fact that you can’t use it without power. Models with power cords are highly recommended. You just need to plug in the shaver to start shaving. Most models also come with batteries, which when fully charged can provide up to 12 hours of shaving. It’s perfect when you’re traveling. Some models, including the best electric shaver at Walmart, may feature automatic shutoff. Once the battery is fully charged, it automatically shuts off to save battery life. As we’ve already mentioned, the best women’s electric shaver can cost you $10 for cheap Walmart electric razors, and up to $100 or more for high-end models. Either way, the most important thing is to buy an electric shaver that gives you the best value for your money. When it comes to the best electric shaver for women, it mostly boils down to personal preference. Some of you who have sensitive skin naturally wants the best women’s razor for sensitive skin. If you’re looking for a budget-friendly investment, then just find an affordable electric shaver on our list above. In any case, the trick is to find the model that feels good on your skin and does the job without breaking the budget. This can even take some time to figure out. But we are sure that you’ve found the perfect match for your preferences!